Easily transportable, the WS-4 makes complying with many Health Department ordinances simple and easy. This unit is equipped with 4 towel racks holding 235 towels each, and 4 individual 30 ounce soap dispensers. 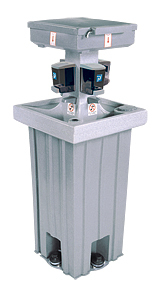 The towel dispensers and main outer tank are a gray/granite color, the inner tank tower is a white/granite color. Hands free foot pump operation. Can be moved by one person. Soap and towel dispensers included. Easier to operate, refill and transport.